Happy week 2 of epilepsy awareness month! 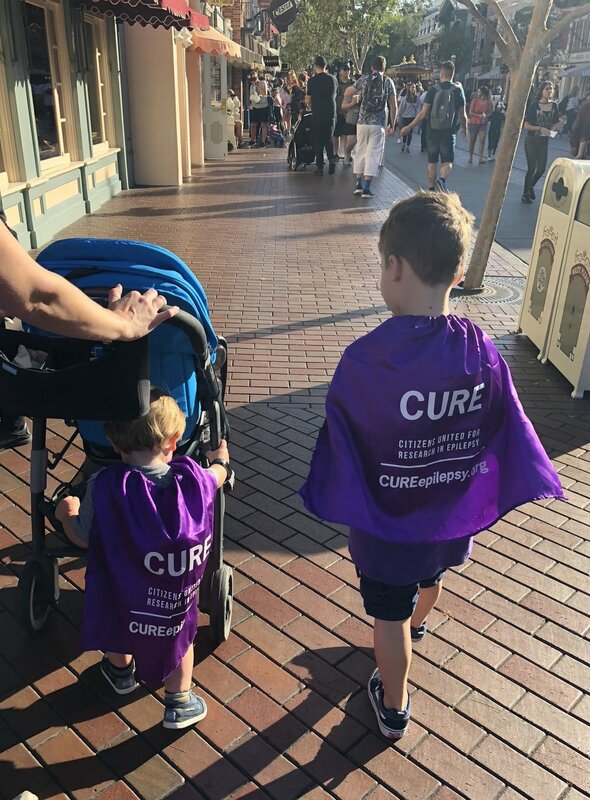 Earlier this week three members of the Cervantes fam traveled West to participate in Epilepsy Awareness Day at Disneyland. After Adelaide’s week in the hospital and increased breathing challenges, putting her on an airplane just didn’t make sense. So, we made the painfully difficult decision to leave Adelaide at home. It was not lost on me that we were going to Disneyland for EPILEPSY awareness day and our loved one with epilepsy was too ill to attend. The bittersweet truth is that she doesn’t know that she missed out on anything and I know she was more comfortable at home. So, the rational side of my brain took over and pushed through. Now that we are back I am so happy we went. Adelaide’s illnesses are beyond tough but we can’t allow them to prevent us from living life - especially for our son, Jackson. After a rough month of having his parents torn between home and the hospital, a trip where he got some Mommy/Daddy solo time brought us all some much needed magic. Thanks, Mickey and friends. Thank you also to our medically trained caregivers that worked 12 hour shifts and one Grandma who manned the battle station solo for 36 hours. Keeping Adelaide stable is not an easy task and we are beyond grateful to them all. But I digress, back to Epilepsy Awareness Day: the inspiring folks running the expo had asked me to speak about being an advocate during one of their hour-long “Listen and Learn” segments. I was honored to be asked but a bit overwhelmed as this presentation was coming off of two nearly back-to-back hospital stays and, as a result, a nearly paralyzingly long to-do list - thanks to my inability to be productive while Adelaide is inpatient. In a throw back to my procrastinating college days I didn’t figure out what I was going to say until the morning of the event…in the shower. While washing, rinsing and repeating I mulled over how our family advocates for Adelaide and epilepsy and concluded there were at least five different areas of importance: medical, political, educational, social and fundraising. Since I covered medical advocacy in my post “Have the fight” I’ll relieve you of deja vu and focus on political and educational advocacy this week. Heigh hooooooo! Now, don’t get your ballgown in a bunch, I’m not about to start saying who anyone should vote for, or drag anyone’s political party. This is simply a reminder that our elected officials work for everyone in their community - including those with epilepsy. To that end, how do they know who they are representing or their concerns if we don’t speak up? Are you having a problem with your health insurance that could be fixed by a state representative? Ask them for a meeting like Erin and Joanne did in Illinois. Are you concerned about seizure education in the school system? Ask your state to pass a law similar to what Lindsay worked on in Kentucky. Or you could ask your town to designate an epilepsy awareness day or month like Tiffany did in Ohio. Change doesn’t happen without a citizen asking for it. These amazing advocates are regular folks that met with their elected officials and made magic happen! So grateful for each of them. If you’re more of a Bashful, less of a Doc and this seems a touch overwhelming, then you can still be an epilepsy voter. When election season rolls around again, do your research. What are the candidates records on health and research funding issues? Do they support pre-existing conditions? Because if they vote to remove this protection anyone with epilepsy could lose their insurance. In Kurt Eichenwald’s book A Mind Unraveled, he details navigating the health care system prior to the ACA and all I have to say is no, thank you. Ok, we made it through the “P” word - onto something less contentious: educational advocacy. This may not apply to those who acquire epilepsy in their post-educational years but for the 1 in 100 kids who do - this is critical. Every state has early intervention services available to children under the age of three which include a variety of different therapies. At age three, EI ends and either private insurance takes over or the child enters the public education system. It is up to the parent to decide which one makes the most sense for their family. When Adelaide turned three we decided to keep her at home and rely on our private insurance to continue her therapy. For us, the benefits of school didn’t outweigh the health risks. That said, it is important to remember that the public school system HAS to take your child regardless of ability! Because we haven’t entered the school system yet I have to admit that my knowledge here is limited except to know that advocating for your child’s Individualized Education Program (IEP) is almost as important as advocating for their medical care. For now, I will suffice it to say that our children spend nearly 40 hours a week in school and it is our responsibility to make sure the school has, at minimum, a basic understanding of epilepsy and that our children receive every opportunity available to them so that they have the chance to lead the fullest and most enriching lives that they can. For assistance here I would recommend reaching out to your local, boots-on-the-ground, epilepsy organization. Belle would be proud. Ok, thats enough for now, I’ve got to get these kiddos to bed. Have a great weekend and if you are in the mood for a Disney movie marathon you know where to find one. Our house might be experiencing a first-rate Mickey Mouse hangover and the only cure seems to be more mouse. Last but not least, a special thank you to our veterans and their families as we honor them on Monday for their service and sacrifices. The incidence of epilepsy in active service members increased by an alarming 52 percent from 2006 to 2010. Our servicemen and women need advocates too.